"There aren't very many good frozen potstickers," Rashmi Bhattachan tells me. I don't disagree. But when I bite into one of her new beef momos, filled with Thousand Hills Cattle Company ground beef, I don't care about potstickers. I just want more of Rashmi's delicious, warm pockets of Nepalese goodness. These tasty momos, seasoned with traditional Himalayan spices (cumin, coriander, garlic, and ginger) and served with a tomato based chutney, disappear quickly in my belly. I think I've eaten four of them before I stop to take a sip of my mango lassi. 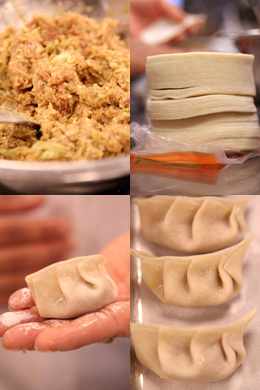 Photo Credit(s): Katie CannonRashmi's path to the perfect momo has been somewhat indirect. She grew up in the town of Pokhara, just 6 miles west of Katmandu in Nepal. Her grandmother - renowned for her cooking - once cooked for the king and queen, Rashmi tells me, serving 40 - 50 different varieties of food. Rashmi came to the U.S. to study human resources in California, moving to St. Cloud to complete her undergraduate studies (Rashmi is probably one of the few momo makers in town with a Master's Degree in Management from Hamline University). Just over two years ago, encouraged by friends and driven by a passion for cooking and a fierce entrepreneurial streak, Rashmi brought her momos to the Mill City Farmers Market for an audition. To say she passed would be an understatement. Renowned Chef Brenda Langton took one taste and knew that Rashmi's food belonged at the hard-to-break-into market. Nowadays, Rashmi sells so many momos that she's had to forego the traditional round form in favor of the more conventional potsticker shape. Although Rashmi has been serving vegetarian momos at the farmers market for two years now, she has only recently begun to experiment with other fillings - specifically, locally raised meat from Thousand Hills Cattle Company and chicken from Kadejan. 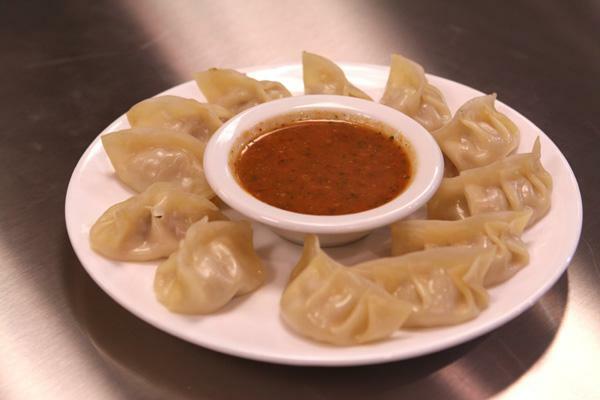 The new momos are fantastic, and Rashmi Bhattachan Photo by Katie CannonRashmi's committment to local food is impressive. As one of 10 chefs who share Midtown Global Market's Kitchen in the Market space, Rashmi feels lucky to have easy access to great local produce and meats and a community that supports her delicious work. One day she will realize her goal of opening Cafe Nepal in St. 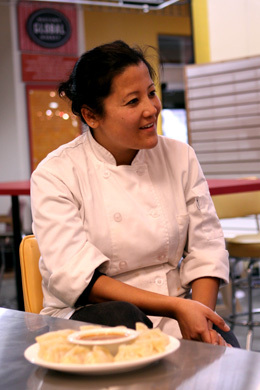 Cloud, where she feels there is a market for good Nepalese food made from the best local ingredients. Unitl then, we are lucky to have her here. Rashmi's momos, chai tea, and mango lassis are available every Friday and Saturday from 11:00 am - 2:00 pm at the Midtown Global Market (they're worth planning your schedule around, and you can get them to go). The Midtown Global Market is located at 920 E Lake St, Minneapolis, MN 55407.